For 10,000 years Native Floridians lived along the St. Johns River and at some point referred to its waters by a variety of names, including Welaka, “river of lakes.” It is recorded that natives called the narrow St. Johns River crossing at today’s downtown Jacksonville, Wacca Pilatka, meaning “place of cow’s crossing.” What is known for certain is early Floridians actively used the narrow river passage – it was the logical place to cross. A little settlement called Cow Ford grew up around the shallows where the Kings Road crossed the St. Johns River on its way from Savannah to St. Augustine. 1513 Spaniard Ponce de Leon sails near the mouth of the St. Johns, but when he actually lands in Florida, the site is farther south. 1562 Captain Jean Ribault first sees the River Mai (later named the St. Johns) on April 30 while searching for a site in the New World for the French Huguenots to settle. Ribault decides on the name “River May” as he actually enters the river on May 1. 1564 The Huguenots establish a colony called Ft. Caroline on the River May (St. Johns). This is the first settlement of men and women seeking religious freedom in the new world. 1565 Spaniard Pedro Menendez, claiming Florida as a possession of Spain, leads troops in an attack on the Huguenot settlement at Ft. Caroline; victorious in battle, Menendez renames both the fort and the river, San Mateo. The Spanish later change the name of the river to the San Juan. 1587 The Catholic Mission of San Juan del Puerto is established at Ft. George Island near the river’s mouth. Father Pareja leads active conversion of North Florida natives. Pareja also captures at least one Timucua St. Johns dialect and creates the earliest books in a native language. 1763 The British ownership of Florida. The San Juan River name is retained, but in its anglicized version, the St. Johns River. Plantations spring up along the St. Johns during the British period in Florida, which lasts until 1783. 1763 Beginning this year and for at least a decade, Ancient Indian trails are widened by the British to become the King’s Road; running from Savannah to New Smyrna, it meets the St. Johns River at the Cowford – a narrowing of the St. John River, a logical place to cross at the foot of today’s downtown Liberty Street. Route of Kings Road through Jacksonville. 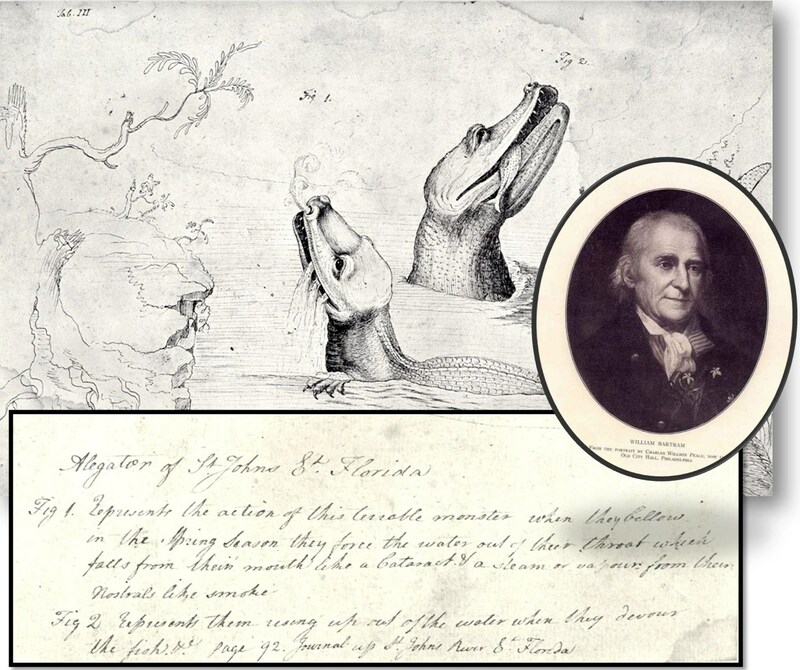 William Batrum and his sketchbook of the “Alligator of St. Johns, Florida”. 1765 After Philadelphia’s John Bartram is appointed royal botanist by King George III, he and his son, William, eventually make their way to East Florida. On December 19, they begin exploration of Florida’s most important river, the St. Johns. They maintain detailed records on the river’s flora and fauna resulting in a published journal that ignites “Florida fever” in England. 1774 William Bartram returns to explore the St. Johns River beginning in March 1774 through November of the year. His journey is financed by wealthy Englishman John Fotheringill, a naturalist and physician. William Bartram’s 1791 masterwork on his Southeast exploration is popularly known as Travels and includes dramatic stories of the St. Johns River. 1779 A town known as St. Johns Bluff or St. Johns Town is laid out on the St. Johns River east of today’s Ft. Caroline. The town is unique as it is a planned community and the first town on the St. Johns. By 1782 the town includes 1500 residents and 300 houses, a visiting minister, a physician, supply stores, a livery stable, a Masonic lodge, a public house, canon and a battery and two taverns! 1783 Florida is returned to the Spanish in 1783, and parts of St. Johns Town are dismantled by the British. The Spanish take over the remaining structures, and rename the town St. Vincent Ferrer; the town is eventually abandoned. 1791 John McIntosh an American hero of the Revolution, leaves Georgia to settle at the St. Johns River. He acquires thousands of acres on both sides of the river and a cotton plantation on the south side of the river. 1822 Jacksonville is founded near the Cow Ford at a starting point, an old bay tree at the foot of the St. Johns River, and is mapped north along the city’s first named street, Market Street. The streets for the town are given by major property owners, Isaiah Hart and John Brady and Hart gets the credit as the town’s founder as it was his idea. The Kings Road now directs all land travel South into East Florida to this point on the St. Johns River. 1864 While traveling North along the St. Johns River, the Civil War Union transport ship, the Maple Leaf, is sunk off the Mandarin Point by Confederate mines that were strategically placed in the river. Today, the underwater Maple Leaf shipwreck site in the St. Johns is considered the nation’s most significant repository of Civil War artifacts. 1867 Harriet Beecher Stowe, perhaps the nation’s biggest celebrity in the late 1860’s, visits Orange Park and Mandarin. Mrs. Stowe is mesmerized by the St. John River and purchases a home on the St. Johns at Mandarin where she and her theologian husband, Calvin Stowe, and twin daughters live for 15 winters. Harriett Beecher Stowe at home in Mandarin. 1868 Tourists begin making their annual winter pilgrimage to Jacksonville; during the next two decades the population of the city will often double, even triple, during the winter months. The river and rail are the major means of transportation to the area. Tourists stay at hotels and boarding houses along the river – or within blocks of the St. Johns. The river supplies tourists with recreational activities, including riverboat jaunts into Florida. 1873 Harriet Beecher Stowe’s 1872 book, Palmetto Leaves, is published. She writes the book from her Mandarin riverfront home. Palmetto Leaves largely details stories of everyday life in Mandarin and highlights Mrs. Stowe’s beloved St. Johns. 1880 Construction beings on the jetties at the mouth of the St. Johns — at the time considered a major engineering feat. An early Spanish name for the river, Rio de Corrientes (River of Currents) offers insight on the great danger boats faced entering the river prior to the jetties. 1890 The first bridge across the St. Johns River at Jacksonville is a train bridge, financed by rail magnate Henry Flagler; Jacksonville’s tourist trade begins to shift south to St. Augustine and beyond. 1901 The May 3, 1901 Fire, the third largest city fire in the nation’s history, levels 148 city blocks in an eight and a half hour rampage. High drama occurs at the city’s St. Johns riverfront where noted citizen Arthur Cummer rescues individuals fleeing the burning docks. Adding to the excitement, a giant waterspout forms in the St. Johns from the fire’s heat. Five of the seven lives lost are attributed to the fire occur at the riverfront. 1906 A 24-foot St. Johns River Channel is completed. 1916 A 30-foot St. Johns River Channel is completed. 1921 A huge celebration introduces the first vehicular bridge across the St. Johns River. It’s fittingly named the St. Johns River Bridge. It’s later renamed for St. Elmo “Chic” Acosta. 1921 The jetties and bar improvement projects are finally “completed”. 1924 The D.A.R. erects the Ribault Monument at Mayport. In 1962, on the 400th anniversary of Riabult’s landing, it is moved to the Ft. Caroline area at a high bluff on the St. Johns River. The dedication of the Ribault monument. 1941 A new bridge crossing the St. Johns opens at Main Street. Later named the John T. Alsop Bridge, it is more commonly referred to as the Main St. Bridge. The bridge provides a direct link between Jacksonville’s south side and downtown. The Main Street bridge, 1941. 1942 Beginning in this year, more than 100 vessels are constructed at St. Johns River shipyard sites. The locations along the St. Johns produce Liberty Ships, Victory Ships, tankers, mine sweepers, and PT boats. The river plays a major role in the city’s crucial World War II effort. 1945 The St. Johns River Channel is deepened to 34 feet. 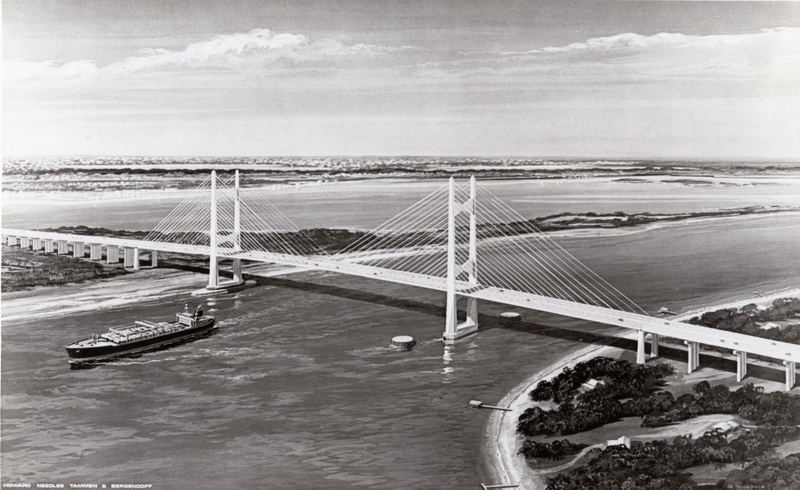 1953 The Mathews Bridge, originally called “the bridge to nowhere,” is built. It connects Arlington and the beaches (now among the most heavily populated areas of the city) to downtown Jacksonville. 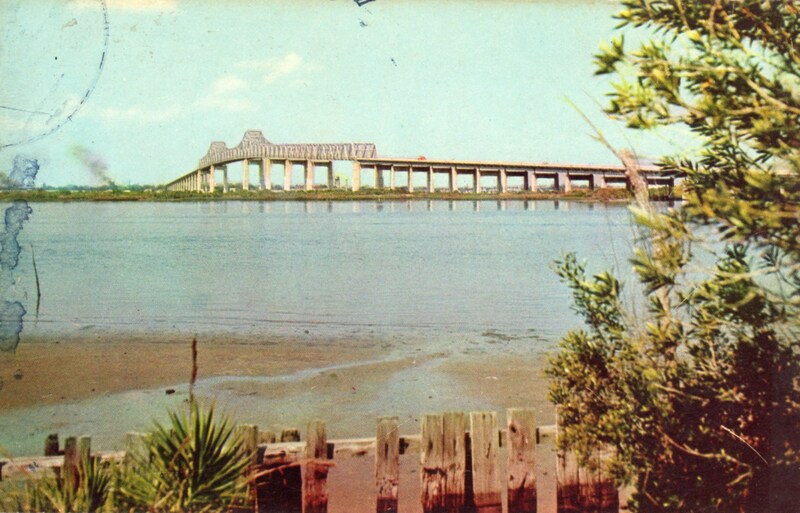 1954 The Fuller Warren Bridge opens; this bridge is now a part of Interstate 95. 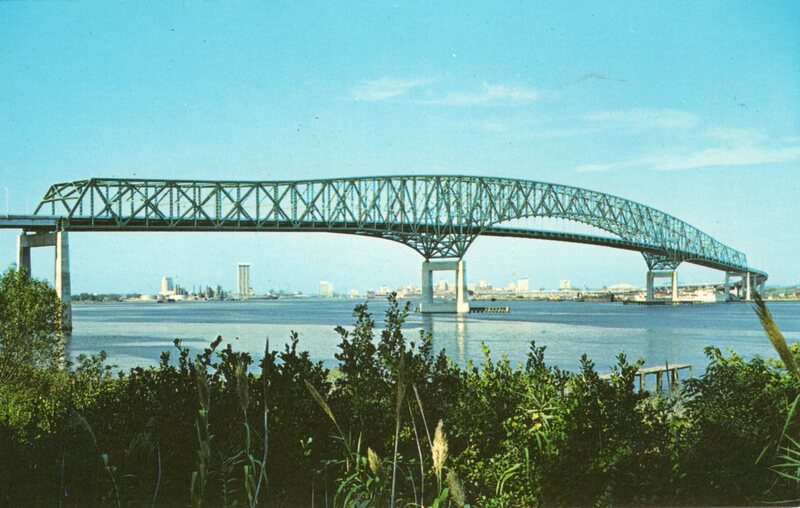 1967 Named for the founder of Jacksonville, the Isaiah D. Hart Bridge opens in this year. This offers a bridge from downtown Jacksonville, near the sports complex, to the southside of town. 1970 Spanning the St. Johns at a point 14 miles south of downtown Jacksonville (in Mandarin), to the opposite shore at Orange Park, Florida, the three-mile Buckman Bridge opens. It is the city’s longest St. Johns span. The Buckman Bridge on I-295 spanning the St. Johns River. 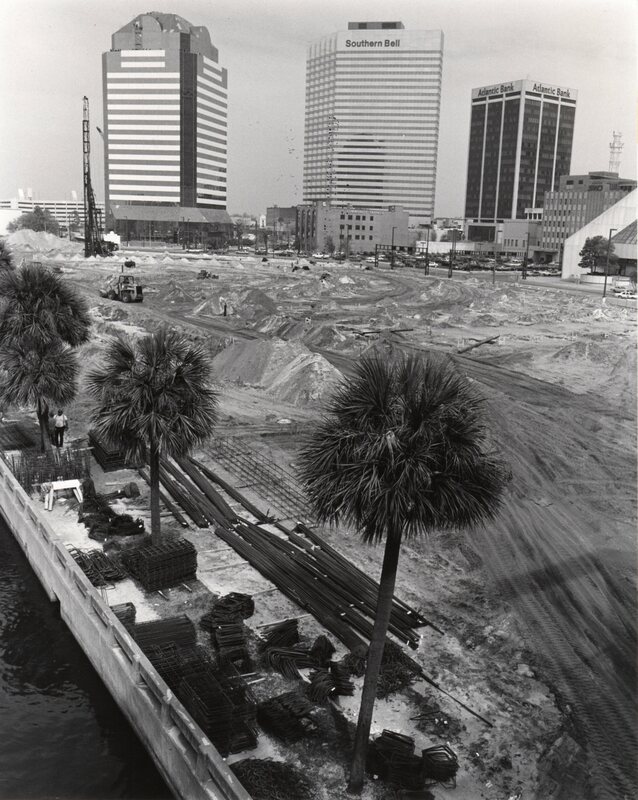 1987 The city begins Southbank and Northbank Riverwalk systems making it possible to walk along the St. Johns River in the downtown area. The Northbank Riverwalk under construction. 1989 The Napoleon Bonaparte Broward Bridge opens. Named for Jacksonville resident and former Florida Governor and U.S. Senator, the bridge is commonly called the Dames Point Bridge; it connects the busy Arlington area of Jacksonville to the northside and offers easier access to the airport. Dames Point Bridge (Napoleon Bonaparte Broward Bridge). Copy furnished by JTA, 1985 from a drawing by builders designers. 1989 The image Jacksonville has garnered as a city of toll bridges over the St. Johns River ends with a grand explosion of a tool booth on the Fuller Warren Bridge. Toll bridges on all other St. Johns River bridges are also removed. 1994 After the 1992 demolition of the 1921 Acosta Bridge, a new Acosta Bridge is completed; this modern bridge is of sufficient height to allow marine traffic clearance. 1997 In January, the Buckman Bridge widening project is completed. Part of Interstate I-295, heavy vehicular use prompted a three year expansion program which resulted in a eight lane bridge. 1998 The St. Johns River is named an American Heritage River.